A miracle of engineering, or just a miracle? 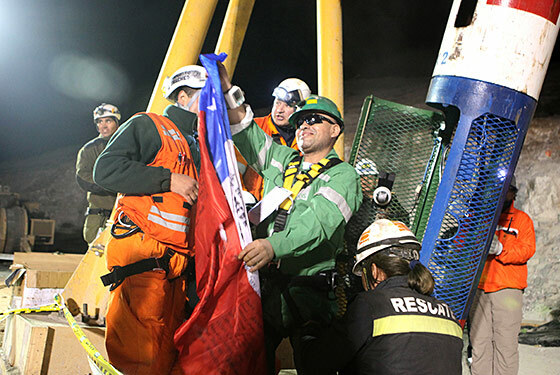 Most of us were glued to our televisions earlier this week as brave rescuers assisted the retrieval of 33 miners who had been trapped more than 600 metres underground in Chile. What was most intriguing about this rescue effort, to me, was the faith that was expressed among the miners as they were brought back to the surface, and even among many onlookers – even as far away as Canada. People were praying, and then praising God all over the place for this miracle. Some in the news media chose to refer to it as a “miracle of engineering”, referring to the contraption that was designed to be lowered to the safe cavern in which the miners spent some two months. To be sure, the developer(s) of that tool deserve an award, if not a raise, for their ingenious design. But this was more than a mere miracle of engineering. True, the emergency and safety steps taken long before this mine disaster occurred enabled these men to live while they awaited their rescuers. The fact that they had air to breathe, food to eat, communication with the outside world, and a safe place to stay proved the value of all that is encompassed by the term ‘workplace health and safety’. But even all this was more than a mere miracle of engineering. Who, after all, gave those who built the retrieval machine, the air line, the communication system, and all that kept these men alive, the ideas? Who gave these people life? What about the miners themselves? Who gave those who encouraged the others not to lose hope the ability to encourage? Who gave those who led the others leadership? Who gave them all families that anxiously awaited their safe return? So people are acknowledging God, the real author of this miracle. Did you notice that the miners, on their ascent, were all wearing the same t-shirt over their green sweat-absorbing coveralls? Those t-shirts were arranged by one miner, whose family had been in touch with the international organization which is known in Canada as Campus for Christ. In translation, on the front, these t-shirts all said, “Thank you, Lord.” On the back, they cited Psalm 95.4: “In his hand are the depths of the earth, and the mountain peaks belong to him” (NIV). These miners, we are learning, had prayer services each day at noon and 6:00 p.m. in that cave underground. They were trusting in the God who performs miracles, who displays his power among the people (Psalm 77.14). They knew that God, in whose hand are the depths of the earth, had not abandoned them. The world may see this memorable occasion as a miracle of engineering. But those miners saw it as a miracle, period. How about you?